Autumn road trips are good. Autumn train trips are better -- especially when you pair them with wine and cheese. 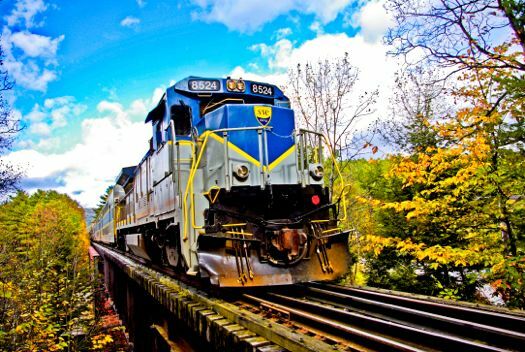 AOA is planning a Saturday excursion into the Adirondacks October 20 on the Saratoga & North Creek Railway, with a wine and cheese tasting at barVino in North Creek, and we'd love for you to come along. The train leaves the Saratoga Springs train station at 10 am for the scenic ride to North Creek. Once there you can wander through some of the antique shops, check out the art at The Exchange, grab lunch, or take an autumn walk and snap some foliage pictures. The train leaves North Creek for the return trip at 3:45 pm. We'll be back in Saratoga by 6 pm. Space is limited, so check your calendar, and sign up now. Tickets for the day are $35, which is a pretty good deal considering that the train trip alone is normally $27. There are 24 seats available, so don't wait. Three 3-oz samples of wine. Additional glasses of wine would be available for purchase. Yep, the Saratoga & North Creek Railway advertises on AOA. Well now I just have to post this, too. I say North Creek railroad trip should include a singalong. Sounds fun. I just bought tickets for me and three friends- can't wait! Took this train last week and stayed overnight at the Copperfield Inn ... neat trip, quaint town, nice shops, good eats! Check-out Sarah's Cafe Bakery and the Hudson River Trading Company, as well as The Exchange! Had breakfast and dinner on board ... linen table cloths and real dishware! This wine and cheese excursion sounds fun too!